This article is about the dress code. For other uses, see Black tie (disambiguation). Black tie is a semi-formal Western dress code for evening events, originating in British and American conventions for attire in the 19th century. In British English, the dress code is often referred to synecdochically by its principal element for men, the dinner suit or dinner jacket (sometime abbreviated to just a DJ). In American English, the equivalent term, tuxedo, is common. The dinner suit is a black, midnight blue or white two- or three-piece suit, distinguished by satin or grosgrain jacket lapels and similar stripes along the outseam of the trousers. It is worn with a white dress shirt with standing or turndown collar and link cuffs, a black bow tie, typically an evening waist coat or a cummerbund, and black patent leather dress shoes or court pumps. Accessories may include a semi-formal homburg, bowler, or boater hat. For women, an evening gown or other fashionable evening attire may be worn. The dinner jacket evolved in late 19th century out of the smoking jacket – originally 19th century informal evening wear without tails designated for more comfortable tobacco smoking – following the first documented example in 1865 of the then Prince of Wales, later King Edward VII (1841–1910). Thus in many non-English languages, it is known as a "smoking". In American English, its synonym "tuxedo" was derived from the town of Tuxedo Park in New York State, where it was first introduced in 1886 following the example of Europeans. Traditionally worn only for events after 6 p.m., black tie is less formal than white tie but more formal than informal or business dress. As semi-formal, black tie are worn for dinner parties (public, fraternities, private) and sometimes even to balls and weddings, although etiquette experts discourage wearing of black tie for weddings. Traditional semi-formal day wear equivalent is black lounge suit. Supplementary semi-formal alternatives may be accepted for black tie: military uniform (mess dress), religious clothing (such as cassock), folk costumes (such as highland dress), etc. Dinner jacket in the context of menswear first appeared in the United Kingdom of Great Britain and Ireland around 1887 and in the United States of America around 1889. In the 1960s it became associated in the United States with white or colored jackets specifically. Tuxedo in the context of menswear originated in the US around 1888. It was named after Tuxedo Park, a Hudson Valley enclave for New York's social elite where it was often seen in its early years. The term was capitalized until the 1930s and traditionally referred only to a white jacket. When the jacket was later paired with its own unique trousers and accessories in the 1900s the term began to be associated with the entire suit. In French, Italian, Catalan, Portuguese, German, Polish, Russian, Spanish, Turkish, and other European languages the style is referred to with the pseudo-anglicism smoking (esmoquin). This generic colloquialism is a false friend deriving from its similarity with the 19th century smoking jacket. In French the dress code may also be called "cravate noire," a term that is sometimes adopted directly into English. The suit with accompanying accessories is sometimes nicknamed a monkey suit and, since 1918, soup and fish - a term derived from the sort of food thought to be served at black tie dinners. Illustration of British peaked lapel and shawl collar dinner jackets, 1898. As substitutes for tailcoats, dinner jackets were originally worn with full dress accessories, including white waist coat. In the 1860s, the increasing popularity of outdoor activities among the middle and upper classes of the United Kingdom of Great Britain and Ireland led to a corresponding increase in the popularity of the then casual lounge suit (standard suit in American English) as a country alternative to the more formal day wear frock coat that was traditionally worn in town. Men also sought a similar alternative to the formal evening tailcoat (then known as a "dress coat") worn every evening. The earliest record of a tailless coat being worn with evening wear is a 1865 midnight blue smoking jacket in silk with matching trousers ordered by the Prince of Wales (later Edward VII of the United Kingdom) from Savile Row tailors Henry Poole & Co. The smoking jacket was tailored for use at Sandringham, the Prince's informal country estate. Henry Poole never saw his design become known as a dinner jacket or cross the Atlantic and be called a tuxedo over there; he died in 1876 leaving behind a well-respected business to be run by his cousin Samuel Cundey. Other accounts of the Prince's experimentation appear around 1885 variously referring to "a garment of many colours, such as was worn by our ancestors" and "short garments coming down to the waist and made on the model of the military men's jackets". The garment as we know it (suit jacket with tailcoat finishes) was first described around the same time and often associated with Cowes, a seaside resort in southern England and centre of British yachting that was closely associated with the Prince. It was originally intended for warm weather use but soon spread to informal or stag winter occasions. As it was simply an evening tailcoat substitute, it was worn with all the same accoutrements as the tailcoat, including the trousers. As such, in these early days, black tie (in contrast to formal white tie) was considered informal wear. In the following decades of the Victorian era, the style became known as a dinner jacket: a fashionable, formal alternative for the tailcoat which men of the upper classes wore every evening. Thus it was worn with the standard accompaniments for the evening tailcoat at the time: matching trousers, white or black waistcoat, white bow tie, white detachable wing-collar formal shirt and black formal shoes. Lapels were often faced or edged in silk or satin in varying widths. In comparison with full dress (cutaway tailcoat), etiquette guides declared dinner jacket inappropriate for wear in mixed company, meaning together with ladies. 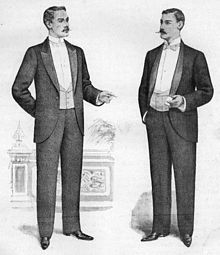 During the Edwardian era, the practice of wearing a black waistcoat and black bow tie with a dinner jacket became the convention, establishing the basis of the current black tie and white tie dress codes. The dinner jacket was also increasingly accepted at less formal evening occasions such as warm-weather gatherings or intimate dinners with friends. After the World War I, the dinner jacket became established as a semi-formal evening wear, while the evening tailcoat was limited to the most formal or ceremonial occasions. During this interwar period, double-breasted jackets, turndown-collar shirts and cummerbunds became popular for black tie evenings as white jackets where experimented with in warm weather. Since then, black tie is often referred to as being semi-formal. In the decades following the World War II, black tie became special occasion attire rather than standard evening wear. In the 1950s, some experimented with coloured and patterned jackets, cummerbunds and bow ties. The 1960s and 1970s saw the colour palette move from muted to bright day-glow and pastel, as well as ruffled-placket shirts as lapels got wider and piping was revived. The 1980s and 1990s saw a return to traditional styles, with black jackets and trousers again becoming nearly universal. Some insist the 21st century has seen increased variation and a relaxation of previous strict standards; midnight blue once again became popular and lapel facings were sometimes reduced to wide edging. 1888 American tuxedo / dinner jacket, sometimes called a dress sack. The earliest references to a dress coat substitute in America are from the summer and fall of 1886 and, like the British references from this time, vary between waist-length mess-jacket style and the conventional suit jacket style. The most famous reference originates from Tuxedo Park, an upstate New York countryside enclave for Manhattan's wealthiest citizens. A son of one of the community's founders, Griswold Lorillard, and his friends were widely reported in society columns for showing up at the club's first Autumn Ball in October 1886 wearing "a tailless dress coat". Although it is not known whether this garment was a mess jacket or a conventional dinner jacket, it no doubt cemented the tailcoat substitute's association with Tuxedo Park in the mind of the public. An essay in the Tuxedo Park archives attributes the jacket's importation to America to resident James Brown Potter, a merchant banker who had worked in London for Brown Brothers. However this claim for Potter cannot be verified through independent sources. Period newspaper accounts indicate that at first the jacket was worn by young mavericks to gatherings considered strictly formal. This led the American establishment to reject it out of hand. It was only by 1888 that polite society accepted its role solely as a summer and informal evening substitute, at which point it became very popular. 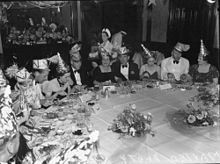 Black tie worn at a dinner party in the 1940s. The earliest dinner jackets were of the same black material as the dress coat with one, two or no buttons and a shawl collar faced in satin or ribbed silk. By the turn of the twentieth century the peaked lapel was equally popular and the one-button model had become standard. When trousers were sold with the jacket they were of the same material. Edwardian dandies often opted for Oxford grey or a very dark blue for their evening wear. By World War I, the grey option had fallen out of favour but the "midnight blue" alternative became increasingly popular and rivalled black by the mid 1930s. Notch lapels, imported from the ordinary business suit, were a brief vogue in the 1920s. A single stripe of braid covering the outseam on each leg was an occasional variation at first, but became standard by the 1930s. At this time double-breasted jackets and white jackets became popular for wear in hot weather. Colour, texture and pattern became increasingly popular in warm-weather jackets in the 1950s. In the 1960s, these variations became increasingly common regardless of season or climate. Notch lapels were once again a fad. By the 1970s, mass-market retailers began offering white and coloured versions of the entire suit to its rental customers. The 1980s vogue for nostalgic and retro styles returned evening wear to its black tone. Notch lapels returned for good in the 1980s, and in the 1990s tuxedo jackets increasingly took on other traits of the business suit, such as two- and three-button styling, flap pockets, and centre vents. These trends have continued into the early 21st century, and midnight blue is now once again a popular alternative. The elements of gentleman's black tie. The dinner suits's accompaniments have also evolved over time. The most traditional interpretations of these elements — dress shirt, low cut waistcoat (in the "V" or "U" shape), black bow tie, oxford dress shoes — are incorporated in the black tie dress code. A dinner jacket (also called a tuxedo in the United States) of black or midnight blue wool (white may be used, traditionally associated with warmer climates) with silk jacket lapels and facings (usually grosgrain or satin) on a shawl lapel, peaked lapel or notched lapel (some fashion stylists and writers see notched lapels as less formal) although they (like peaked and shawl) were used (though somewhat rarely) in some of the early forms of the garment. Trousers with a single silk or satin braid covering the outer seams, uncuffed and worn with braces. A black low-cut waistcoat or a cummerbund. A white dress shirt (a marcella or pleated bib is traditional) with double (or "french") cuffs and a turndown collar. While the turndown is most appropriately semi-formal, the attached wing collar has been popular with American men since the 1980s. However, many style authorities argue that the attached version now typically offered is insubstantial with minuscule wings and inappropriately paired with soft pleated fronts. Shirt studs and cufflinks. Some classic etiquette authorities limit studs to stiff-front marcella shirts only and prescribe pearl buttons for soft-front models instead. A black evening waistcoat or cummerbund. Black dress socks, usually of silk or fine wool. Some style guides recommend that the socks should come up to the knee. Black shoes — traditionally patent leather court shoes (pumps); now often highly polished or patent leather Oxford dress shoes instead (without brogueing). Covered cuff buttons on a dinner jacket. The peak lapel of a dinner jacket featuring a working buttonhole and silk grosgrain facings. The original and most formal model of dinner jacket is the single-breasted model. The typical black tie jacket is single-breasted with one button only, with jetted (besom) pockets and is of black or midnight blue; usually of wool or a wool–mohair, or wool-polyester blend, although other materials, especially silk, are seen. Although other materials are used, the most appropriate and traditional for the dinner jacket are wool barathea or superfine herringbone. Double breasted models are less common, but considered equally appropriate. Dinner jackets were commonly ventless before World War I, but today come ventless, with side vents, or with center vents. The ventless style is considered more formal, while the centre vent is the least formal. The lapels (traditionally pointed and shawl) are usually faced with silk in either a grosgrain or a satin weave, but can also be silk barathea. A notched lapel is not always considered to be appropriate for a dinner jacket. However, according to the Black Tie Guide, the peaked lapel and shawl collar are equally authentic and correct. The buttons should be covered in similarly coloured material to the main part of the jacket, which would ideally be either self-faced or covered with the same material as the lapels. Some higher-end single-breasted jackets, both new and vintage, tend to be fastened with a link front closure which is visually similar to a cufflink; this method of closure is still common in the United Kingdom. The double-besomed jetted (slit) hip pocket is the only style understated enough to complement the dinner jacket. Flap pockets are not considered appropriate for formal attire's refined minimalism due to their busier and bulkier design and are simply an attempt by dinner jacket manufacturers to save money by using standard suit patterns (although sometimes they will trim the edges of a flap pocket so that the flap can be tucked in or removed if desired). [according to whom?] Besom welts can be of self fabric or trimmed with the lapel's silk facing, though classic menswear scholar Nicholas Antongiavanni suggests that for the English this latter touch "is a sure sign of hired clothes." The dinner jacket should also have a welt breast pocket to hold a pocket handkerchief, which should generally be self-faced rather than covered with silk. An example of a link front style closure of a dinner jacket, featuring silk grosgrain. Emily Post, a resident of Tuxedo Park, New York, stated in 1909 that "[Tuxedos] can have lapels or be shawl-shaped, in either case they are to have facings of silk, satin or grosgrain." She later republished this statement in her 1922 book Etiquette, adding that only single-breasted jackets are appropriately called tuxedos. There is a fashion movement suggesting that a man's appearance when wearing the wider and higher peak lapel is superior to the narrower notch lapel. White dinner jackets are often worn in warm climates. They are ivory in color rather than pure white, and have self-faced lapels (i.e., made of the same fabric as the jacket) rather than silk-faced lapels. They are generally worn with the same types of shirts and accessories as black dinner jackets, though the turndown collar and cummerbund preferred to the wing collar or waistcoat. Similarly, the shawl lapel is more common in white dinner jackets. In the United Kingdom, the 20th-century etiquette was that white dinner jackets are never worn, even on the hottest day of summer, but are reserved for wear abroad. Today, white dinner jackets are frequently seen at weddings, formal beach events, and high-school proms, in the United States and at some concerts (famously for instance the Last night of the proms) in the United Kingdom. In tropical climates, such as in Imperial Burma, desert fawn was historically used as the less formal color. At one time, the (civilian) mess jacket was also an option in warmer climates. It is generally considered inappropriate for a man to remove his jacket during a formal social event, but when hot weather and humidity dictate, the ranking man (of the royal family, the guest of honour) may give men permission by noticeably taking off his jacket. In anticipated hot weather, Red Sea rig is specified in the invitation, although this dress is esoteric in civilian circles, and is particular to certain expatriate communities. Traditionally, the only neck wear appropriate is the black bow tie that is a self-tie and should always match the lapel facing of the dinner jacket and braiding of the trouser seams. The bow tie is tied using a common shoelace knot, which is also called the bow knot for that reason. Black tie trousers with a side stripe. Black tie trousers traditionally have no turn-ups (cuffs in US English) or belt loops. The outer seams are usually decorated with a single braid of silk or a material that matches or complements the lapel facing. Traditionally, braces (suspenders in US English), hidden by the waistcoat, are used to support the trousers. Belts should not ever be worn with black tie trousers. Evening trousers can be flat-fronted or pleated today; pleats first coming into fashion in the 1930s. While flat-fronted trousers are more fashionable at present, pleated trousers may be considered more comfortable by men who have wider hips and a narrow waist. A waist covering should generally be worn as part of a black tie ensemble. Either a low cut waistcoat or cummerbund may be worn, but never both at the same time. Although the English authority Debrett's consider that wearing a waistcoat is smart, they no longer consider either waist covering to be essential. The American authority, The Emily Post Institute, considers them to be an essential component of proper black tie attire. Waist coverings shouldn't be matched to wedding theme colours. Waistcoat with shawl collar, closed with studs. A low cut waistcoat should be worn when wearing a single-breasted coat. The waistcoat plays an important part in black tie's refined minimalism by helping to conceal its working parts by discreetly covering the trouser's exposed waistband and the shirt bosom's bottom edge. Waistcoasts come in the 'V' or rarer 'U' shape, in backless or fully backed versions, double or single breasted, with or without lapels. Single breasted styles typically have three buttons, and double breasted ones three or four rows. Before World War II, while black tie was still gaining acceptance, men would wear a white waistcoat, along with other details now associated primarily with white tie, such as stiff fronted shirts. However, this style, though increasingly viewed as an affectation, is still acceptable in the United States. The waistcoat should be made from either the same fabric as the dinner jacket (traditional) or the same silk as the jacket's lapels (popular). When a waistcoat has lapels, they should be faced in the same silk as those of the jacket; in this case it is considered more refined if the body is made from the same fabric as the jacket. The buttons may be self-faced or covered in the same silk as the lapels. Vintage waistcoats were sometimes closed with studs made from onyx or mother of pearl, which were often surrounded by a setting of silver or gold. A waistcoat is never worn with a double breasted jacket. Since this style of jacket is never unbuttoned, the waist of the trousers is never exposed, and therefore does not need to be covered, though before World War II an edge of waistcoat was often shown between the jacket and shirt. A cummerbund may be worn with a dinner jacket in lieu of a waistcoat and, although it is considered slightly less formal, it is equally correct. It looks especially well with a shawl collar dinner jacket but may be worn in conjunction with peak lapels. The material of the cummerbund should be silk satin, grosgrain (or faille), or barathea to match that of the bow tie. It features upward facing folds, which were originally used to store theatre or opera tickets, and are now considered to be more decorative than functional. Just like the waistcoat, cummerbunds are not worn with a double breasted jacket. As the cummerbund is seen as an extension of the trousers, traditionally it should the same colour, i.e. be black. However, the Black Tie Guide endorses deep and rich colours as a tasteful way to introduce some colour into an outfit that is otherwise monochromatic. Bright colours, such as those often worn by members of wedding parties, should be avoided and the bow tie must remain black in any case. Some higher quality models feature a hidden pocket and an elastic loop to fasten to the trousers. Dress shirts designed to be worn with black tie are sometimes called "tuxedo shirts" in American English. Traditionally, the shirt is white, has a bibbed front that is either marcella or pleated, a turndown collar, and double (or "french") cuffs. In the early-20th century, a piqué shirt with a detachable wing collar and single cuffs such as is worn with white tie was used, and in the 1960s and 1970s ruffled bibs were popular, but neither styles are often seen today. The wing collar originally disappeared in black tie after the 1920s when the appropriately semi-formal attached turndown collar shirt became preferred, but it has been popular with American men in a less substantial, attached form since the 1980s. 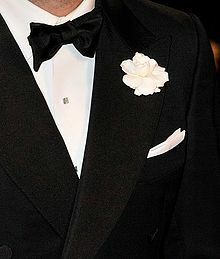 However, many style authorities argue that the wing collar should remain the domain of white tie for aesthetic reasons. Etiquette maven Miss Manners is one of those who feel that while the bow tie's uncovered band is fine in a white-on-white scheme, “gentlemen with their black ties exposed all around their necks look silly." A vintage set of shirt studs and double-sided cufflinks with a smoke mother of pearl inlay in a gold setting. Although some style authorities consider the wing collar to be an acceptable option for black tie shirts, they should not be worn with double cuffs or a pleated bib, and are better suited to the more formal single-breasted peak lapel jacket. They should feature a bib that is either marcella or starched and include stiff single cuffs (secured with cufflinks), made of the same fabric as the bib; this type of shirt is exactly the same as one worn with white tie attire. The collar in this case should be tall and stiff, which may be attached or detachable. When a full dress shirt is worn in this fashion, it should be accompanied by the white marcella waistcoat ordinarily associated with white tie. Wearing white tie accessories in this manner is considered by many to be an affectation. Debrett's do not endorse the wing collar as being compatible with the black tie dress code. The more formal marcella version of the shirt fastens with matching shirt studs. These are most commonly in silver or gold settings, featuring onyx or mother-of-pearl; various geometrical shapes are worn, e.g., circles (most common for studs), octagons, or rectangles (most common for cufflinks). There has been no consistent fashion preference for gold or silver, but studs with mother-of-pearl are more formal and therefore often associated with white tie. The soft-front pleated version of the shirt should be fastened with mother-of-pearl buttons, typically supplied with the shirt on a separate strip of fabric. Alternatively, a fly-front shirt, appropriate with both the marcella and pleated bibs, conceals the placket for a more minimalistic look. There are several types of cufflinks that may be worn with black tie. The most formal and decorative are the double-panel type, which dress both sides of the cuff and are connected by a chain or link of metal; this model conceals the mechanism by which the cuff is secured. The most common, and least decorative, are the swivel bar type; while these are acceptable, they leave the inner side of the cuffs and mechanism exposed which is incongruous with formal dress. An oxford shoe in patent leather worn with evening dress or dinner dress. The most formal and traditional shoes are patent leather opera pumps (court shoes) decorated with grosgrain bows. The more popular alternative currently is the black lace-up Oxford shoe, in patent leather or calfskin, with a rounded plain toe. Brogueing or any other decorative patterns should never be seen on Black Tie footwear. Matte finish pumps are also seen. Shoes are almost invariably black and patent leather is considered more formal than matte finishes while pumps are considered more formal than lace-ups. Generally considered too informal for black tie are shoes with open lacing, such as the Derby shoe (bluchers in American English). Notable alternatives include the black button boot (primarily of historical interest only) and the monogrammed Albert slipper which was originally worn only at home. Hosiery is black socks made from fine wool or silk. Button hole flower with white pocket square. Most etiquette and fashion guides of the current decade recommend keeping colour touches and favoring a single colour, usually dark; muted reds, such as maroon, are a traditional choice. Handkerchief: A handkerchief in linen (traditional), silk, or cotton is usually worn in the breast pocket. Although precedents for tasteful exceptions exist, pocket squares are normally white, and should not match the waist covering or bow tie. Boutonnière: A flower may be worn. Red and white carnation, blue cornflower, and rosebud have all been popular at times. In France, the boutonnière is usually a gardenia. Outerwear: Black tie events do not involve outerwear and coats and gloves are no longer considered part of the dress code. However, etiquette for what to wear in public in transit to and from black tie occasions was stiffer in earlier eras and remain an option: Matching overcoats are usually black, charcoal, or dark blue, and traditionally of the Chesterfield style. A guards coat was also once popular, and a lighter topcoat can be worn in summer. Historically, an Inverness coat was also worn. Until the mid-20th century, gloves and scarves were always worn, and are still occasionally seen in gray leather and white silk, respectively. White kid gloves have never been standard with black tie, remaining exclusive to white tie dress. Hat: The 20th-century standard hat for black tie was a black (or midnight blue) Homburg in winter, or straw boater in spring and summer. Fedoras were originally regarded as too informal but have become more common recently. Top hats were originally worn with black tie, but had been reserved to white tie and morning dress from World War I. Black tie dress does not require a hat today. Miniature medals with black tie. Decorations and orders: Military, civil, and organizational decorations are usually worn only to full dress events, generally of formal governmental or diplomatic significance. Miniature orders and awards are typically worn on the left lapel of the jacket, and neck badges, breast stars, and sashes are worn according to country-specific or organizational regulations. Unlike in white tie, where decorations are always permitted, the dress code will usually give some indication when decorations are to be worn with black tie. Timepiece: Traditionally visible timepieces are not worn with formal evening dress, because timekeeping is not supposed to be considered a priority. Pocket watches are acceptable. An example of a black evening gown. A ballgown, evening gown or cocktail dress. Cocktail dresses may be long or moderately short and needn't be black. In England, evening trousers with a palazzo cut are another acceptable option. Examples of dinner suits for women (1960s) by Yves Saint Laurent in a M. H. de Young Memorial Museum, San Francisco, United States. 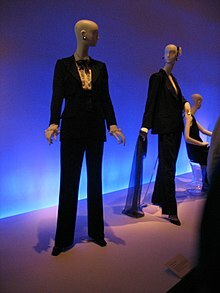 Still, while "black tie" dress code traditionally implies evening dress for women, in 1966 famous couturier Yves Saint Laurent proposed Le Smoking, a dinner suit designed for women. Most initial reactions to the collection were negative. The designer took bits and pieces from both men's suit and women's clothing and combined it with new ideas. As this dinner suit was designed for women, it was different from the normal male dinner suit. The collar was more feminine, as the shape and curve were more subtle. The waistline of the blouse was narrowed to show the body shape, and pants were adjusted to help elongate the leg. It pioneered long, minimalist, androgynous styles for women, as well as the female use of power suits and the pantsuit in modern-day society. Some described Saint Laurent's initiative as empowerment of women by giving them the option to wear clothes that were normally worn by men with influence and power. Fashion photography echoes the influence of this suit in shoots that feature androgynous models with slicked-back hair in a mannish three-piece suit, a style that was first popularised in photographs by Helmut Newton. This suit has continued to influence fashion designers' collections through the 2000s. In practice, however, dinner suits designed for women have never achieved the popularity of evening gowns, as properly encouraged by dress code interpretators. Sweden's Crown Princess Victoria and Prince Daniel Westling arriving at the Riksdag's Black Tie Gala Performance on the eve of their wedding. In traditional Western dress codes etiquette "black tie" is intended for adult men's evening wear. Traditionally, in the 20th century black tie (in contrast to formal white tie) was considered informal. In the 21st century black tie is often referred to as being semi-formal. Black tie is worn to private and public dinners, balls, and parties. At the more formal end of the social spectrum, it has to a large extent replaced the more formal white tie. Once more common, white tie dress code is now fairly rare, being reserved for only the most formal occasions. Black tie is traditionally worn only after six o'clock in the evening, or after sundown during winter months. Black tie's rough daytime equivalent is the stroller, which is less formal than morning dress because (as with black tie) it replaces the tailcoat with a lounge coat. Curiously, in opposition to the trend seen in evening dress, the less formal stroller is now extraordinarily rare, whereas morning dress is still relatively common. The most popular uses of the dinner suit in the United States in the early 21st century are for balls, galas, proms, cruise ship dinners and weddings. In these circumstances the dinner suit's styling and accessories are most commonly chosen according to the wearer's tastes. Less popular are black tie events, such as gala fundraisers, where men typically wear more traditional dinner suits and accessories as dictated by the dress code. They are also often worn by male musicians at concerts. As a general rule, boys do not wear dinner jackets much before they are 15, or dress coat before they are about 18. Jacob Rees-Mogg in black tie debating at The Cambridge Union. Some university debating societies, such as at Oxford, Durham and University College London conduct at least some of their debates in black tie. Notably, the Cambridge Union abolished the long-standing mandatory wearing of black tie at debates in 2002. Learned societies, such as the Royal Aeronautical Society, may also follow a similar practice. Historically, white tie was worn for the opera. Since the 20th century, however, black tie has been worn increasingly and today a dark lounge suit is generally acceptable. In the 21st century, many opera houses in the English-speaking world do not stipulate black tie. For example, neither the Royal Opera House nor the Sydney Opera House maintain a black tie dress code. Notwithstanding, black tie is customary at English country house operas, such as during the summer Festival at Glyndebourne. Black tie should also be worn at a ballet or orchestra gala. At more formal dinners on cruise ships the dress code will typically be black tie although a dark lounge suit may be worn as a substitute. In 2013 Cunard, noted for its adherence to formal dress codes, relaxed its dress standards. As of 2015[update] Cunard requires one of a dinner jacket, a dark suit, formal national dress or military uniform for gentlemen diners on formal evenings. Similarly, the luxury cruise liner, Seabourn, stipulates either a dinner suit or a dark business suit on formal evenings. In the last few decades, in place of the traditional white tie or morning dress, black tie has been increasingly seen in the United States at weddings. However, etiquette and clothing experts continue to discourage or condemn the wearing of black tie for weddings, such as Emily Post (1872–1960) and Amy Vanderbilt (1908–1974), the latter arguing that "no man should ever be caught in a church in a tuxedo." In the United Kingdom and the rest of Europe, although a minority accepts black tie at evening Wedding receptions, including some Jewish weddings, it is seldom worn at church weddings or civil ceremonies where instead white tie, morning dress or a lounge suit is normally favoured. Other than that, supplementary alternatives include local variations of white tie etiquette, such as highland dress in Scotland, if neither white tie nor black tie is preferred. ^ Random House Unabridged Dictionary, Second Edition, Stuart Berg Flexner and Lenore Crary Hauck, editors, Random House, New York (1993). ^ a b c d e f g "Black Tie, Dress Codes, A to H, British Behaviour, Etiquette and Style | Debrett's". www.debretts.com. Retrieved 2017-02-02. ^ The Black Tie Guide original research. ^ a b c "History: Late Victorian Era". Black Tie Guide. Retrieved 2011-04-01. ^ "Tux Britannia". Black Tie Blog. ^ Nguyen, Nam H. (2018-04-26). "27000 English-French Words Dictionary with Definitions: 27000 Dictionnaire des Mots Anglais-Français Avec Définitions". ^ Millar, Jamie (1 February 2016). "The Complete Guide to Men's Dress Codes". fashionbeans.com. Retrieved 2016-06-10. ^ Korach, Myron; Mordock, John. Common Phrases: And Where They Come From. Globe Pequot. pp. 167, 182. ISBN 978-1-59921-683-6. ^ Ayto, John; Simpson, John (2010). The Oxford dictionary of modern slang (2nd ed.). Oxford University Press. p. 296. ISBN 978-0-19-923205-5. ^ Hollander, Anne (1993). Seeing through clothes (1. California paperback printing ed.). Berkeley: University of California Press. p. 384. ISBN 978-0-520-08231-1. ^ "The Tuxedo - Henry Poole". henrypoole.com. Retrieved 2019-03-06. ^ "Tuxedo Origins: English Beginnings". Black Tie Blog. ^ a b Safire, William (5 May 1985). "On Language; Come as You Are". The New York Times Magazine. New York Times. p. 436. Retrieved 2017-03-01. ^ "History: Late Victorian Era". Black Tie Guide. Retrieved 2017-02-02. ^ "History: Edwardian Era". Black Tie Guide. Retrieved 2017-02-02. ^ "History: Jazz Age". Black Tie Guide. Retrieved 2017-02-02. ^ "History: Depression Era". Black Tie Guide. Retrieved 2017-02-02. ^ a b Wright USAF (Ret. ), Col. Stephen E. (15 July 2014). Air Force Officer's Guide: 36th Edition. Stackpole Books. p. 202. ISBN 9780811713771. ^ "History: Postwar Period". Black Tie Guide. Retrieved 2017-02-02. ^ "History: Jet Age". Black Tie Guide. Retrieved 2017-02-02. ^ "History: Counterculture Era". Black Tie Guide. Retrieved 2017-02-02. ^ "Millennial Era: Black Tie Optional". Black Tie Guide. Retrieved 2017-02-02. ^ "Tuxedo Origins: The Tailless Tailcoat Puzzle". Black Tie Blog. ^ reprinted in "The Saga Of American Society: A Record Of Social Aspiration 1607–1937". 1937. ^ "The Prince and Mrs. Potter" (PDF). Tuxedo Park FYI. ^ "Tuxedo Origins: Formal Sundries". Black Tie Blog. ^ "Tuxedo Origins: American Backlash". Black Tie Blog. ^ "History: Edwardian Era". Black Tie Guide. Retrieved 2011-04-01. ^ a b "Spotlight: The Notched Lapel". Black Tie Blog. ^ "History: Depression Era". Black Tie Guide. Retrieved 2011-04-01. ^ "History: Postwar Period". Black Tie Guide. Retrieved 2011-04-01. ^ "History: Jet Age". Black Tie Guide. Retrieved 2011-04-01. ^ "History: Counter-culture Era". Black Tie Guide. Retrieved 2011-04-01. ^ "History: Yuppie Years". Black Tie Guide. Retrieved 2011-04-01. ^ "History: Millennial Era". Black Tie Guide. Retrieved 2011-04-01. ^ a b "Classic Black Tie: Tuxedos (Dinner Suits)". Black Tie Guide. Retrieved 2011-04-01. ^ a b c "Classic Black Tie: Shirts". Black Tie Guide. Retrieved 2017-02-02. ^ "Esquire: The Magazine for Men". 1996. ^ Antongiavanni, Nicholas (2006). The Suit: A Machiavellian Approach to Men's Style. New York: Harper Collins. ISBN 9780060891862. ^ a b "Attire Guide: Dress Codes from Casual to White Tie". The Emily Post Institute. Retrieved 2011-05-12. ^ "Black Tie 101" (PDF). Indiana University Bloomington. Retrieved 2011-05-12. ^ "Classic Black Tie: Warm-Weather Black Tie". Black Tie Guide. Retrieved 2011-04-01. ^ Wyse, Elizabeth (2015). Debrett's Handbook. London, United Kingdom: Debrett's Limited. p. 188. ISBN 978-0-9929348-1-1. ^ a b "Black Tie Guide | Supplemental: Formal Weddings". www.blacktieguide.com. Retrieved 2016-05-29. ^ "Special occasions – dress codes – black tie". Debretts. Retrieved 2011-12-23. ^ "Classic Black Tie: Waist Coverings". Black Tie Guide. Retrieved 2011-04-01. ^ Clayton, Nicholas (21 July 2016). A Butler's Guide to Gentlemen's Grooming. Pavilion Books. ISBN 9781849944144. ^ von Adlerstein, Marion (2 April 2007). The Penguin Book Of Etiquette. Penguin UK. ISBN 9780857967800. ^ a b "Black Tie Guide | Classic Alternatives". www.blacktieguide.com. Retrieved 2016-05-29. ^ Flusser, Alan (2002). Dressing the Man. United States: HarperCollins Publishers. p. 249. ISBN 978-0060191443. ^ "Black Tie Guide | White Tie: Shirt". www.blacktieguide.com. Retrieved 2016-05-29. ^ a b "Black Tie Guide | Classic Accessories". www.blacktieguide.com. Retrieved 2016-05-29. ^ "Classic Black Tie: Footwear". Black Tie Guide. Retrieved 2011-04-01. ^ Wyse, Elizabeth (2015). Debrett's Handbook. London, United Kingdom: Debrett's Limited. p. 187. ISBN 978-0-9929348-1-1. ^ "Black Tie Guide | Contemporary: Other". www.blacktieguide.com. Retrieved 2016-05-29. ^ Bridges, John; Curtis, Bryan (2003). A Gentleman Gets Dressed Up. Nashville, Tennessee, United States: Rutledge Hill Press. p. 71. ISBN 978-1401604714. ^ Hémard, Ned (2010). "New Orleans Nostalgia: Gardenias, Magnolias and Oleanders" (PDF). New Orleans Bar Association. Retrieved 2019-02-01. ^ "Black Tie Guide | Classic Outerwear". www.blacktieguide.com. Retrieved 2016-05-30. ^ "Black Tie Guide | Vintage: Outerwear". www.blacktieguide.com. Retrieved 2016-05-30. ^ "Black Tie Guide | Vintage: Warm Weather". www.blacktieguide.com. Retrieved 2016-05-30. ^ Wyse, Elizabeth (2015). Debrett's Handbook. London, United Kingdom: Debrett's Limited. ISBN 978-0-9929348-1-1. ^ "Black Tie Guide | Supplemental: Decorations". www.blacktieguide.com. Retrieved 2016-05-30. ^ Stewart, Marjabelle Young (15 April 1997). The New Etiquette: Real Manners for Real People in Real Situations. Macmillan. p. 463. ISBN 9780312156022. ^ Morgan, John (1 April 2007). Debrett's New Guide to Etiquette and Modern Manners: The Indispensable Handbook. Macmillan. p. 338. ISBN 9781429978286. ^ "Le Smoking". Dazed Digital. Archived from the original on 2009-02-07. ^ "The Ultimate Guide to Choosing a Party Dress Code". cateringonthemove.com.au. ^ "Black Tie Guide – Etiquette: Tradition". www.blacktieguide.com. ^ "Formal Debates - the Oxford Union". www.oxford-union.org. ^ "Durham Union Society – Friday Night Debates". dus.org.uk. Retrieved 2018-01-28. ^ "UCL Debating Society Foundation Dinner 2019 Tickets, Sat, Mar 23, 2019 at 6:30 PM". Eventbrite. Retrieved 2019-03-17. ^ Rich, Jonathan (2004). The Push Guide to Choosing a University. Nelson Thornes. ISBN 9780748790272. ^ "Cambridge Union relaxes dress code". The Independent. Retrieved 2019-03-17. ^ "Black Tie Debate and Dinner (1) - Royal Aeronautical Society". Royal Aeronautical Society. ^ "Protocol Professionals, Inc. - Opera Protocol Tips". protocolprofessionals.com. ^ Showker, Kay (25 March 2010). The Unofficial Guide to Cruises. John Wiley & Sons. p. 117. ISBN 978-0-470-63721-0. Retrieved 2015-01-02. ^ Kim, Soo (18 March 2013). "Cunard relaxes cruise ship dress code". telegraph.co.uk. The Daily Telegraph. Retrieved 2015-01-02. ^ "Is there a dress code on board?". cunard.com. Cunard. Retrieved 2015-01-02. ^ "Welcome Aboard Seabourn" (PDF). seabourn.com. Seabourn Cruise Line Limited. p. 21. Retrieved 2016-06-10. ^ Ford, Charlotte; DeMontravel, Jacqueline (2001). 21st century etiquette: a guide to manners for the modern age. Barnes & Noble Books. p. 210. ISBN 978-1-56731-629-2. ^ "Male Dress Codes". debretts.com. Amies, Hardy (2013). The Englishman's Suit. London: Quartet Books Ltd. ISBN 978-0-7043-7169-9. Antongiavanni, Nicholas (2006). The Suit: A Machiavellian Approach to Men's Style. HarperCollins. ISBN 978-0-06-089186-2. Boyer, G. Bruce (2015). True Style: The History and Principles of Classic Menswear. New York: Basic Books. ISBN 9780465053995. Donald, Elsie, ed. (1981). Debrett's Etiquette and Modern Manners. London: Debrett's Peerage Limited. ISBN 978-0-905649-43-6. Flusser, Alan (2002). Dressing the Man: Mastering the art of Permanent Fashion. New York: HarperCollins. ISBN 978-0-06-019144-3. Flusser, Alan (2010). Style and the Man. New York: HarperCollins. ISBN 978-0061976155. Hume, Lucy (2017). Debrett's Wedding Handbook. Debrett's Limited. ISBN 978-0-9929348-4-2. Keers, Paul (1987). A Gentleman's Wardrobe: Classic Clothes and the Modern Man. London: Weidenfeld & Nicolson. ISBN 978-0-297-79191-1. Post, Anna; Post, Lizzie (2014). Emily Post's Wedding Etiquette (6 ed.). New York: The Emily Post Institute, Inc. ISBN 978-0-06-232610-2. Post, Peggy; Post, Anna; Post, Lizzie; Post Senning, Daniel (2011). Emily Post's Etiquette. New York: The Emily Post Institute, Inc. ISBN 978-0-06-174023-7. Roetzel, Bernhard (2009). Gentleman: A Timeless Guide to Fashion. Cambridge: Tandem Verlag GmbH. ISBN 978-3-8331-5270-2. Schneider, Sven (2017). Black Tie & Tuxedo Guide (1 ed.). Saint Paul, Minnesota: Gentleman's Gazette LLC. Storey, Nicholas (2008). History of Men's Fashion: What the Well-Dressed Man is Wearing. Barnsley: Pen & Sword Books Ltd. ISBN 978-1-84468-037-5. Tuckerman, Nancy; Dunnan, Nancy (1995). The Amy Vanderbilt Complete Book of Etiquette: 50th Anniversay Edition (1 ed.). New York: Bantam Doubleday Dell Publishing Group Inc. ISBN 978-0-385413428. Wyse, Elizabeth (2015). Debrett's Handbook. Debrett's Limited. ISBN 978-0-9929348-1-1. The Emily Post Institute provides a breakdown of traditional categories of progressing formality in dress for men & women. Debrett's is the most prominent British authority on etiquette, which discusses the elements of black tie. Life, Tailored have a guide for men on how to dress for any black tie event. Pullman, Nigel. "Dress codes" (PDF). Livery Companies of the City of London. Retrieved 2018-10-17. Pithers, Ellie. "Black-Tie Dress Code For Women". Vogue. Retrieved 2019-04-07.